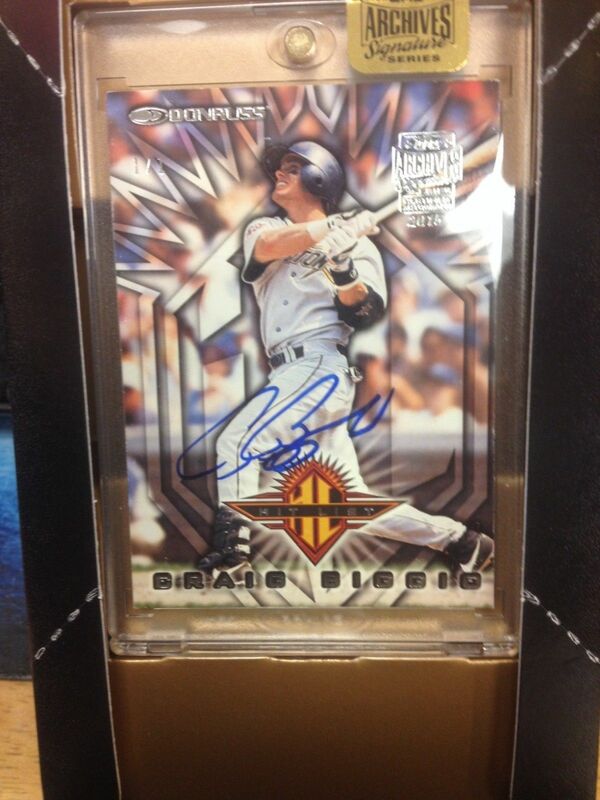 I picked up this 1999 Fleer Sports Illustrated Bo Belinsky autograph for $7 - I suppose this certified autograph card is just another add my all-time Angels autograph collection. 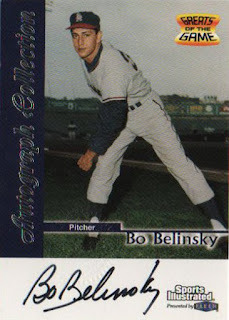 Learning more about his MLB career, Belinsky was the first pitcher to win four consecutive games to start a career for the Angels - he threw a no-hitter to get that fourth straight win back in 1962. 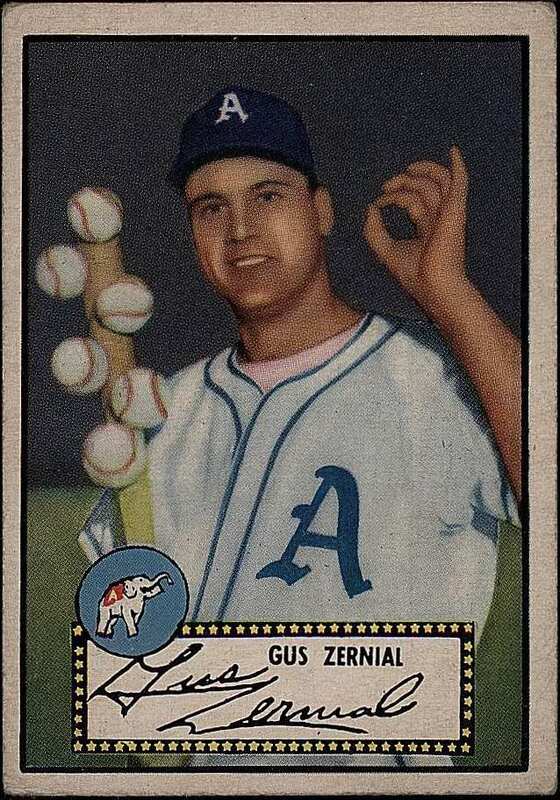 He might not have a substantial MLB career, but Belinsky's status as a pro ballplayer in Los Angeles allowed him - to live it up, date Hollywood starlets and party hard. I was able to go to a Seattle Mariners home game back in 2013 and brought cards for Henderson to get signed in case I saw him - I did see him, got my cards signed and took a picture of a guy taking a photo op of Henderson with a fan. When I heard about Henderson's recent passing, I knew he had a son with a genetic disorder to take care of [actually obscured in the photo op photo] - it's hard to think that his adult son Chase won't have his father to lean on. 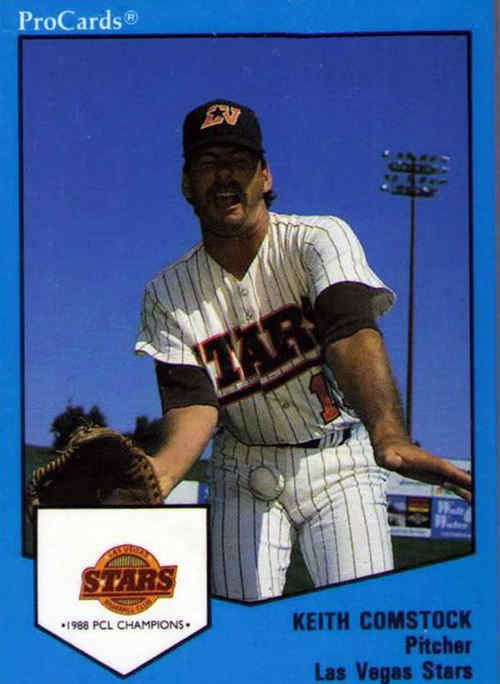 As an Angels fan, there is no way not to hear about the home run Henderson hit in the 1986 American League Division Series - that not only derailed the Angels' pennant hopes but perhaps started the fatal downward spiral for the Halo pitcher that gave up the home run. 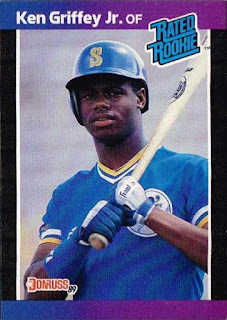 As is, I really remember Henderson more as a 'junk wax guy' who was more of complimentary player type on the Bash Brothers Oakland A's teams of the late 1980s-early 1990s - he wasn't a star compared to Jose Canseco, Mark McGwire or Rickey Henderson, but I always heard about how 'Hendu' always smiled and had the right attitude out on the field. I'd created a Top 15 list of random cards to pick up as a fun, scavenger hunt deal of sorts - I'd basically forgotten about the list created back in September, but ended up going back to it and at the very least, trying to knock off some cards. 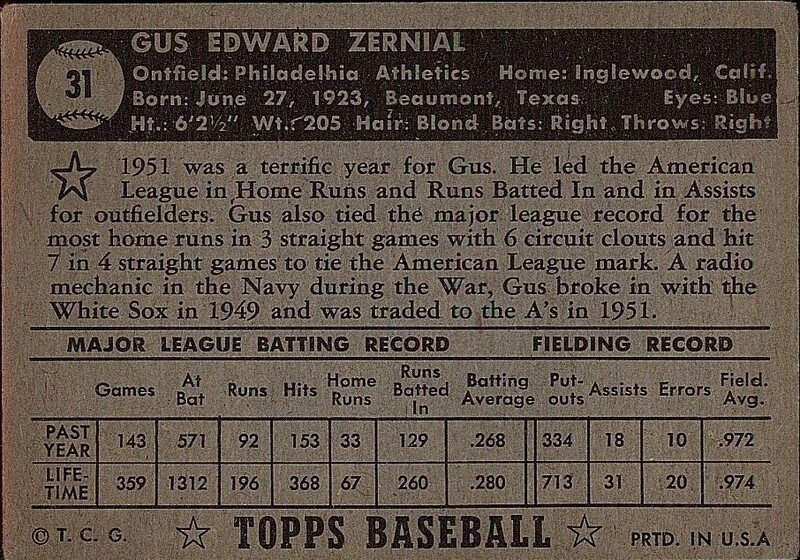 The Zernial card caught my eye mainly because of the six baseballs affixed to his bat - he hit 6 home runs in 3 consecutive games in 1951 and another just after the original image was taken. 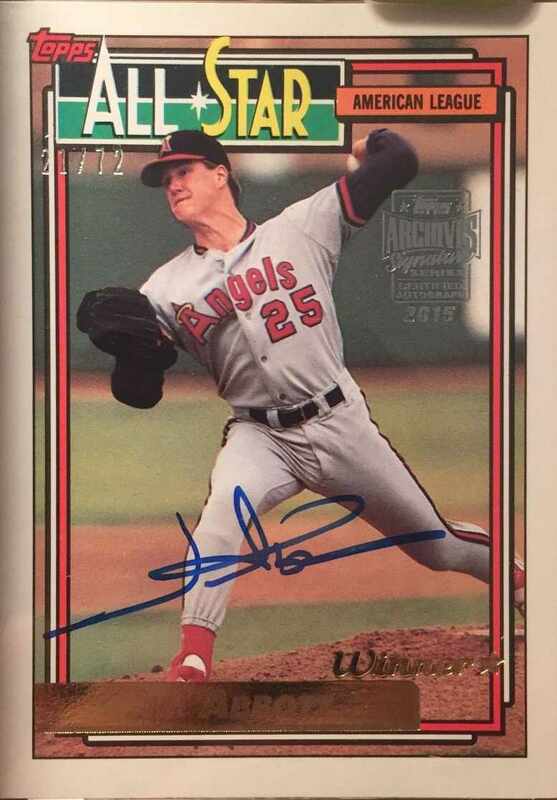 Picking up this certified autograph card for about $13 gave me a reason to ‘buy into’ a 2015 Topps Archives Signature Series without paying at least $45-$55 for a pack - I needed a 1992 Topps All-Star subset #406 card of Abbott for my Angels frankenset and while Abbott has probably has made his share of appearances, I haven’t made it to any of them. Because it is for a project, I've broken the Topps Archives Signature seal and free the card from the one-touch holder - besides being autographed, certified and stamped as a card from a 2015 product, the other wrinkle is the buyback card used is the Gold Winners parallel. I picked up a 2013 Onyx Platinum Prospects Triple Threat autographed card for $5 - watching Sano hit is fun and hopefully there is no sophomore slump suffered by this imposing young slugger. 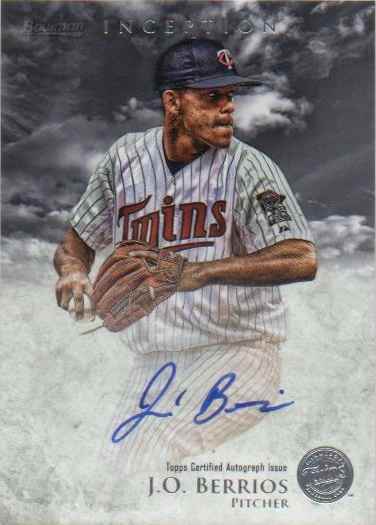 I picked up a couple of autographs featuring the top pitching prospect [currently #20 among MLB.com's Top 100] from the Minnesota Twins - I'm looking to hold onto these cards for at least the next few years and at least not have to worry about getting Berrios' autograph if he turns out to be a pitching star. 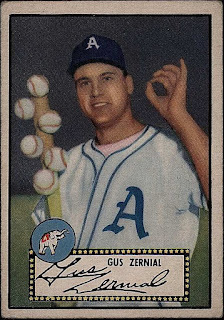 I picked this card up for about a dollar as another vintage card 'curiosity' to put away - I've never really considered owning the card, but I've seen over the years, so I wondered if I could randomly add a copy of the 'quirky, oddball' card to my collection. 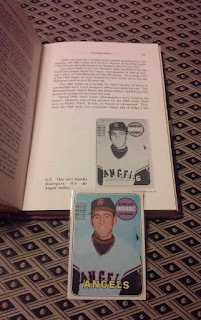 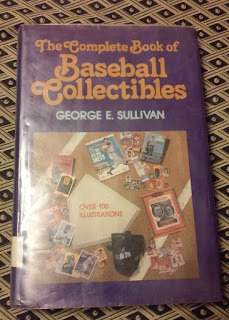 I probably first learned of the uncorrected error card picturing the California Angels' bat boy in this early 1980s book - I bought the actual book years ago when it was finally discarded and I decided to dig it out for a photo op with the actual card. 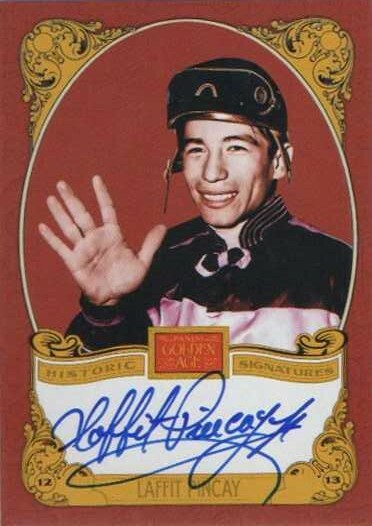 I picked up this 2013 Panini Golden Age Historic autograph card of jockey legend Laffit Pincay for about $3 - I remember when a buddy would tell me about going out for Pincay's autograph and I'd be rolling my eyes because I didn't see him as a mainstream athlete. Years later, I may still be in the dark as far as learning about Pincay's career accomplishments as a jockey - however his autograph is sure pretty nice and the card maybe a hidden gem [not that it's going to be worth more than what I paid]. 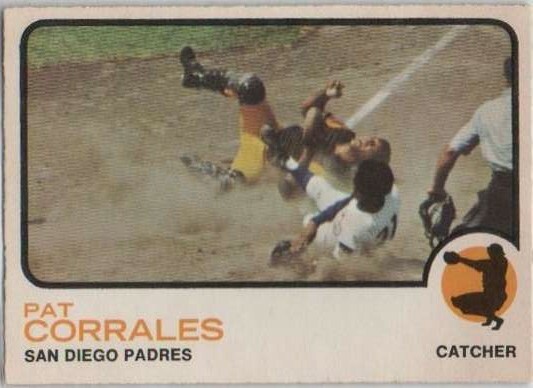 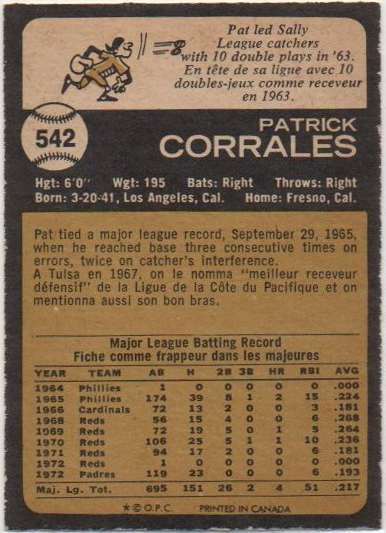 I've heard about this card is passing, though perhaps it was a comment from a Night Owl Cards blog post that gave me a new perspective on the card - the comment links to a YouTube upload of a Ferguson Jenkins documentary where the actual play at the plate happens, with Jenkins being the incoming baserunner who runs over Corrales. A copy of the card may not make or break a 21st century card collection, but for about a dollar, it's a nice vintage card 'curiosity' to put away - I actually picked up the OPC version because I've always perceived the thinner card stock to be a little cleaner than the thicker, dingier Topps version. 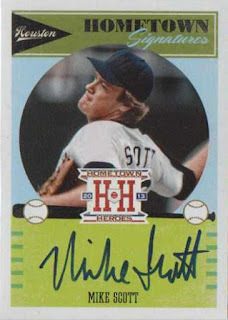 I picked a certified autograph of the former Houston Astros pitcher and 1986 National League Cy Young Award winner for $4 - I knew Scott mostly as a junk wax guy, but the pitcher had a five-year run as an ace quality pitcher with the Astros in the mid 1980s before injuries presumably led to his retirement. 2011 TRISTAR Obak Autographs Red Don Schwall #A40 - I picked up a certified autograph of the 1961 American League ROY with the Boston Red Sox. 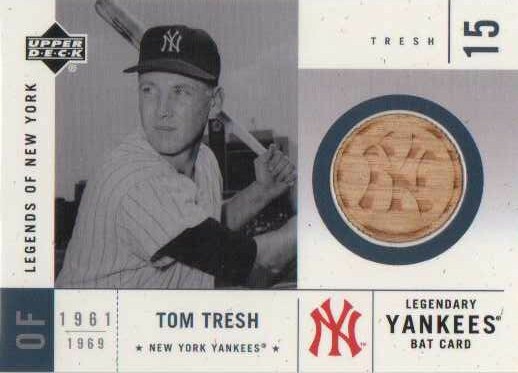 Maybe the bat swatch looks kind of blemished, but for about $3 - I grabbed this otherwise nice looking relic card of the 1962 American League ROY. 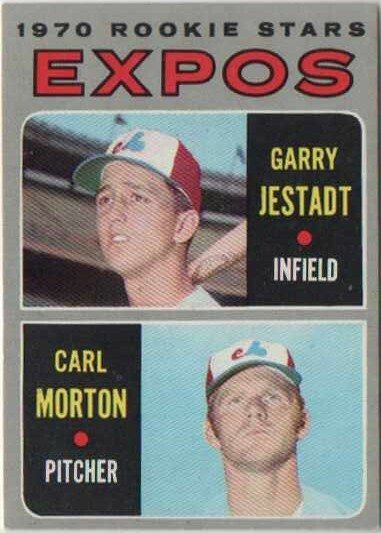 1970 Topps Expos Rookie Stars Garry Jestadt/Carl Morton #109 - Morton was the 1970 National League ROY and this card was the last, impulsive 'BF' pick-up with whatever funds I had left [maybe about $0.77] to spend before I was going to have my stash shipped. I actually have a 1977 Topps card card of Morton, but it pictures him on the Atlanta Braves - so that kind of doesn't count. 1974 Topps Gary Matthews #386 - I have a random in-person autographed 1987 Fleer card but pictures Matthews in a Chicago Cubs uniform. 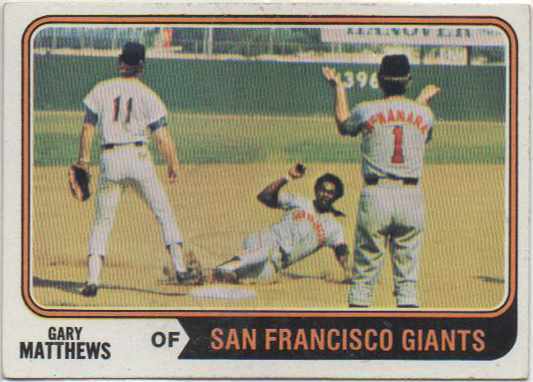 I wanted a team appropriate card close to Matthews' 1973 National League ROY season with the San Francisco Giants - the bonus with this $0.40 pick-up is the nice horizontal action image of Matthews sliding into third base [with the third baseman and third base coach pictured]. 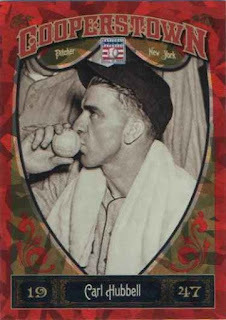 I've got some Parker cards in hand though not one picturing him in his prime with the Pittsburgh Pirates, a team he won the National League MVP with in 1978 - to fill a hole in my award winners collection, I picked up a Parker 2012 Panini Golden Age Museum Age Authentic Collection material card for $2. 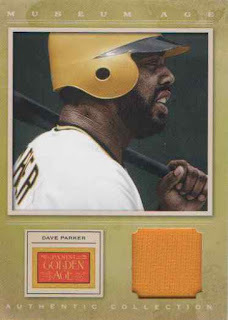 I was really looking for an autograph card but couldn't decide on the cards available - the color of the material caught my eye and I'd like to make believe the swatch was taken from something Parker wore in a game when he was a Pirate. 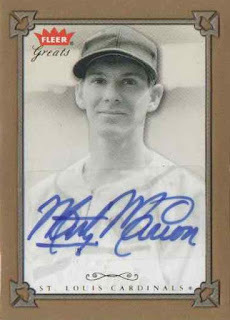 2004 Fleer Greats of the Game Autographs Marty Marion #GBA-MM - I picked up a certified autograph card of the 1944 National League MVP with the St. Louis Cardinals for $7 and change. 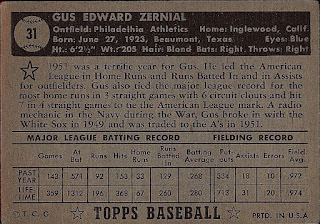 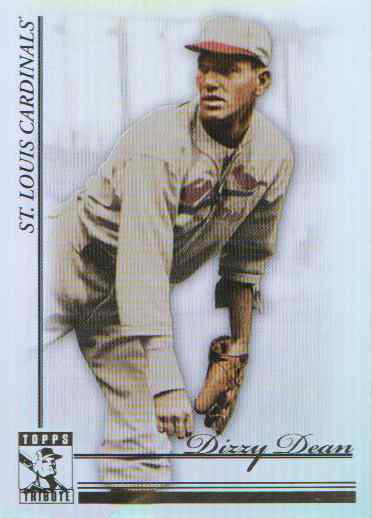 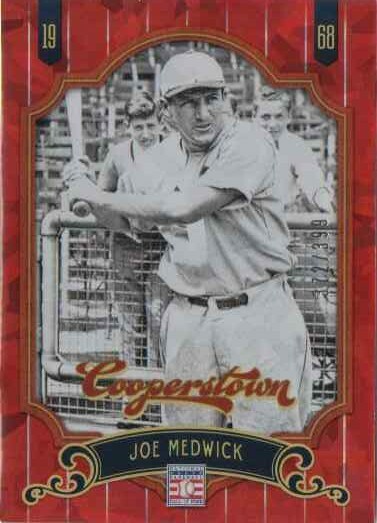 For my award winners collection, I'm trying to hunt down the cards of guys who won MVP awards before WWII - players from the era might be a 'special focus' because I have to be more creative in looking for suitable cards for my collection. 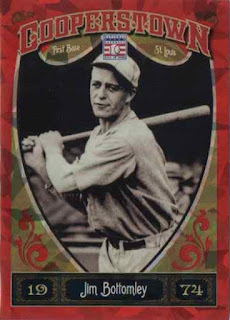 I'm not likely picking up original trading cards from when these players were alive and playing professional baseball - reprint and retro sets seem to be my bets to find the cards that fills holes in my collection, though I still want to get a little picky. Besides being a professional baseball player, Forster had his 15 minutes of fame back in the mid 1980's - when he was called a 'tub of goo' by David Letterman. 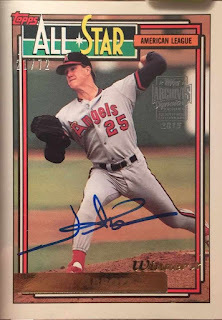 The lefty spent his last MLB season with the Angels in 1986, getting into 41 games with 41 innings pitched - I was able to pick up this certified autograph card for my all-time Angels autograph collection for about $2 and it's another scribble I don't have to worry about picking up. 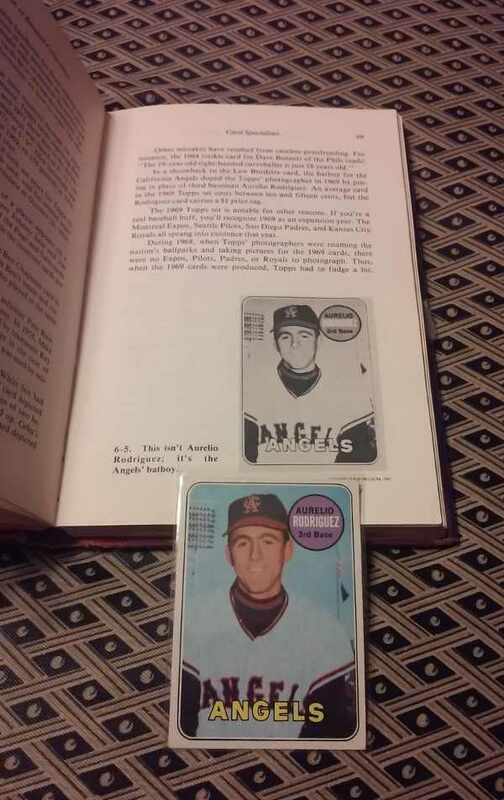 The notorious 'all-or-nothing' slugger played all of 10 games as an Angel in 1977 - but it's kind of fun to dig around for the obscure one-time Angels, especially when I'm looking to add more subjects to my all-time Angels autograph collection. 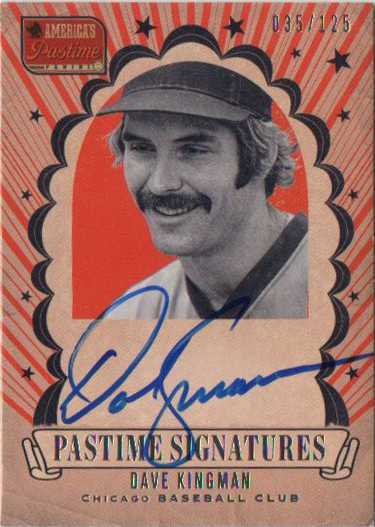 While he signs through the mail for a small fee [$10], TTM isn't a thing for me at the moment - so I grabbed this certified autograph card for about $3. For the extremes Kingman represented as a big league ballplayer, he might have been considered a cult favorite of sorts, though learning bits and pieces about his MLB career - I can't get past the idea that he once mailed a live rat to a female reporter as some sort of neanderthal protest against women covering MLB baseball towards the tail end of his playing career. 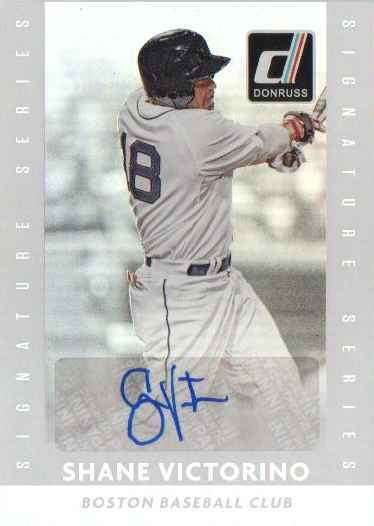 I don't know what Victorino was doing in an Angels uniform in 2015 but he appeared in 34 games and had 84 official at-bats with the team - I picked up this 2015 Donruss insert for $4 because I just needed the most random of Victorino autograph cards to put in my all-time Angels autograph collection. Because Panini baseball products are not licensed by Major League Baseball - maybe it's a more suitable card for my collection than a comparable card plastered with another MLB team's logo, whether it's on the player's image and/or somewhere on the card. 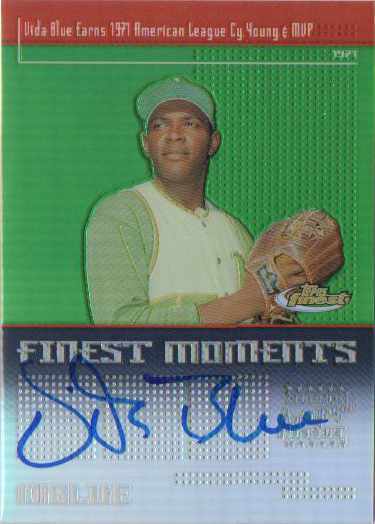 I wanted at least one certified autograph card of Blue to represent one of the two MLB awards he won in 1971 - this $3 card goes into my MVP collection, while I have a 2002 Topps Archives card [a reprint of his 1971 Topps card] for my Cy Young Award collection. I remember tagging along with a friend to a golf tournament 10-15 years where Blue was appearing along with others like Bobby Bonds [former Angel, since passed away] and Gene Mauch [former Angels manager, since passed away] - unfortunately I had no concept of getting Blue, Bonds or Mauch on anything specific [like getting a card signed to fill a card project], so the best I got Blue and Bonds on was a program with a bunch of other random autographs. 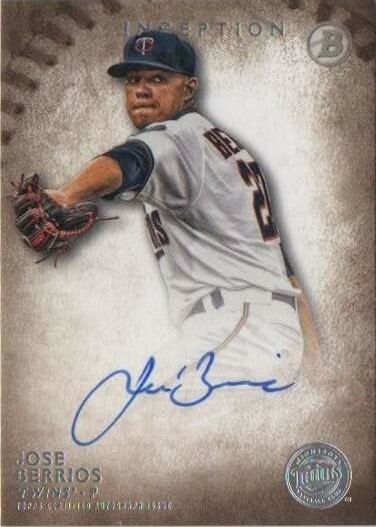 I figured picking up a certified Blue autograph would be the easiest if I wanted a signed card - Blue still signs through the mail for $10, though I didn't want to bother putting together a TTM request I'd have to wait for. 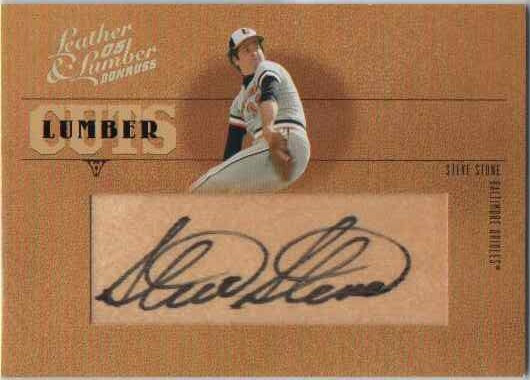 I picked up a 2005 Donruss Leather & Lumber Lumber Cuts Stone for $3 - I've known him mostly as the long time TV color guy with the Chicago Cubs and also the Chicago White Sox, not really as a MLB pitcher who was awarded the 1980 American League Cy Young as a Baltimore Orioles pitcher. I would have never thought about picking up a card like this but I've been trying to add some wrinkles here and there for my award winners collection - maybe chase down the occasional certified autograph and/or memorabilia card for more of the rank-and-file guys as opposed to the more notable award winners [who command a premium for their better autograph / memorabilia cards]. I do remember getting a random card signed by Stone in-person years ago - he was signing with some pen [either ballpoint or some weak pen that wasn't a Sharpie] that didn't stick to the card surface at all. 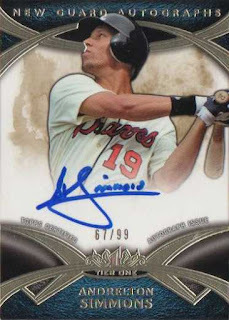 I also saw him sign randomly at some other point, maybe four or five years ago - though I never bothered to get him to sign a specific card. 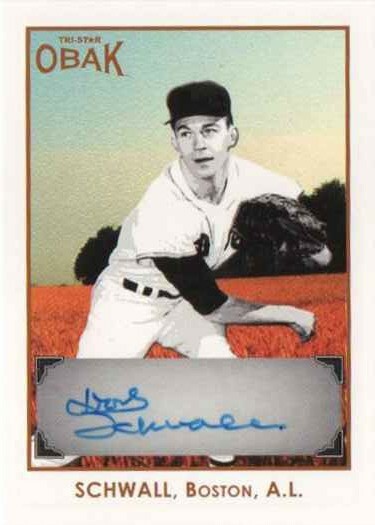 I was looking to add a Simmons autograph for my all-time Angels collection since the team traded for him last month - I picked up this certified autograph along with about 21 other miscellaneous cards during a Black Friday promotion at my current 'LCS' in Redmond, Washington COMC. Compared to the other cards I was looking at, it seems like Simmons used a thicker, bolder pen to autograph this card - I think Topps uses a Lumocolor pen for their autograph signings, but the thickness of the ink would lead to think a Sharpie was used instead. 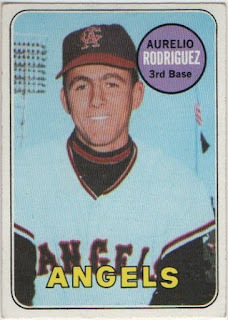 I was on vacation with my parents overseas when I learned about the news of Simmons' acquisition - I didn't expect the Angels to trade their No. 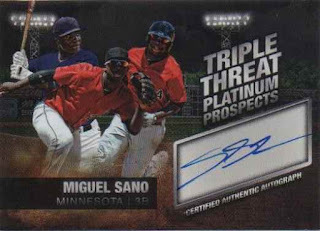 1 prospect Sean Newcomb [along with fellow prospect Chris Ellis, long-time Angels shortstop Erick Aybar and cash] for Simmons and a minor leaguer, but Simmons is regarded as the best defensive shortstop in all of Major League Baseball. I was looking forward to seeing Newcomb as the next young arm to come through the minors for the Angels - but for all the plays he makes at shortstop, Simmons just has to hit a little bit more to really fit the profile of a star shortstop an MLB team can build around. 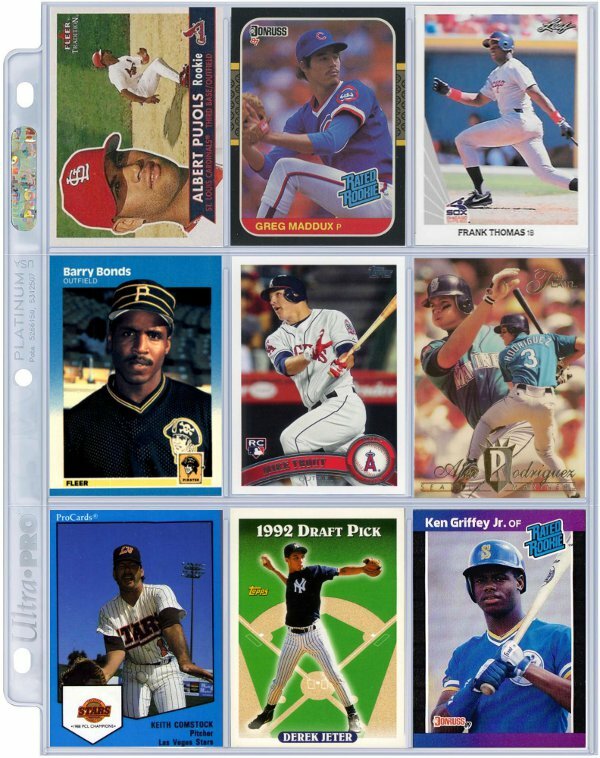 My best binder page represents nine cards that stick out in my collection - for better or for worse. 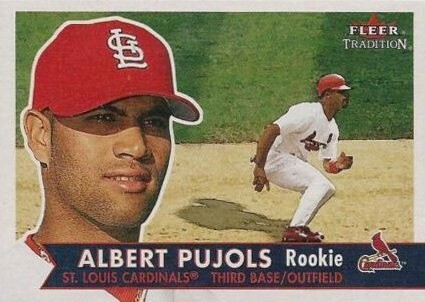 2001 Fleer Tradition Albert Pujols #451 - ever since he made his MLB debut in 2001, he has always been a guy to universally collect though the Pujols the Angels have is just not the same guy that played for the St. Louis Cardinals. 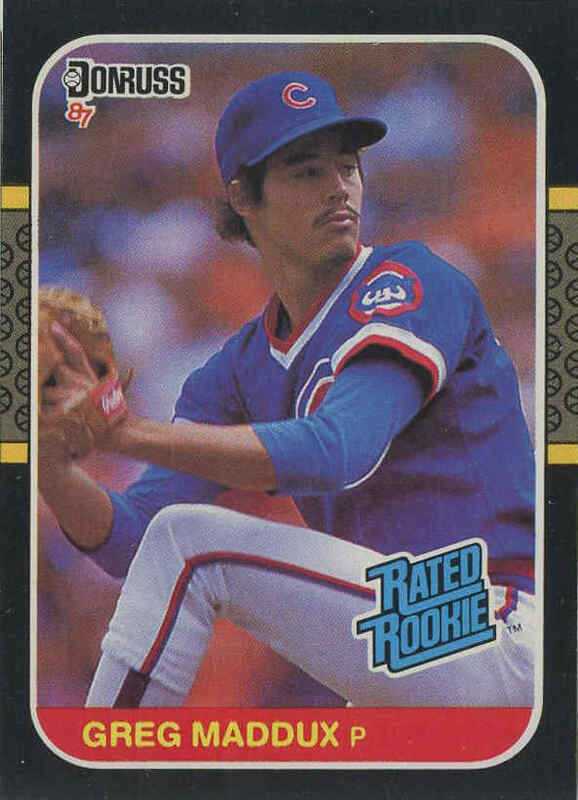 1987 Donruss Greg Maddux #36 - I never really noticed Maddux until he won his first Cy Young Award in 1992 and I had to pick up his key rookie card, which might have been going for about $6. Because the card came out during junk wax era, the card maybe worth $3 these days - but between the wisp of facial hair he sporting and the Cubs uniform he is wearing sort of coming together with the design [with the Rated Rookie subset banner too], the card has grown on me. 1990 Leaf Frank Thomas #300 - it was either him or Ken Griffey Jr. battling it out for the top spot of Beckett Baseball Card Montly Magazine's Hot List back through the mid 1990s. Thomas was a dominant offensive force and even though his numbers took a dive in his 30's - he still had his moments and has Hall of Fame plaque to show for his numerous achievements. 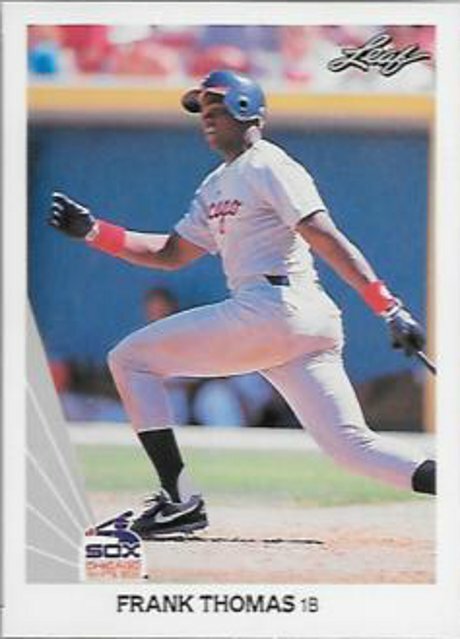 I'm not really sure what I paid for this card but I think I bought it 10-15 years ago - the price was likely less than the $30 I spent for a Sammy Sosa rookie card from the same set. 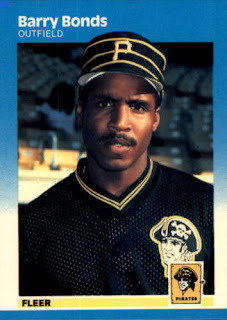 1987 Fleer Barry Bonds #604 - I prefer the juiced up version rather than the great all-around baseball player through the 1990's because he just didn't give a hoot and at least on the field, it was fun watching him portrayed as the biggest heel of the Steroid Era. 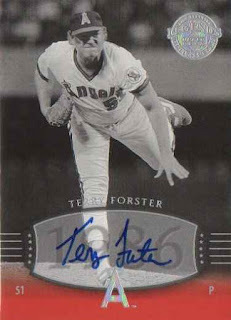 I was eating up all his theatrics and I probably paid about $60 for this card - like the Maddux rookie, it was a junk wax era card, but I was to hoping to possess the best mainstream rookie card of an all-time great. 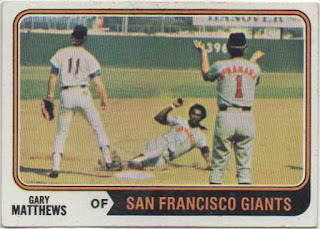 Bonds might have been easy to ignore if he was an average ballplayer augmented his numbers and kind of faded away - but Bonds was already a superstar talent who managed to propel his numbers to historic heights. 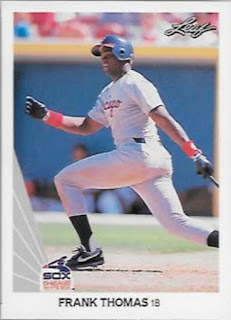 While he is now trying to make inroads back into the game as the Florida Marlins hitting coach - Bonds is probably not going to be inducted into the Hall of Fame anytime soon and my once prized card is worth about $3. 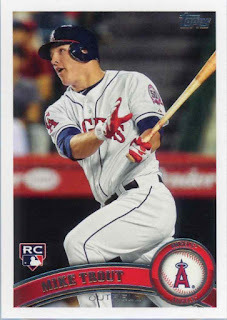 2011 Topps Update Mike Trout #US 175 - it's a no brainer to have this guy's rookie card in the mix, even though there is a tinge of disappointment, just because I never got one of his 'big money' first-year autograph cards. 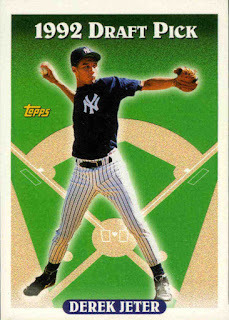 1994 Flair Alex Rodriguez #340 - ever since he had his first big season in 1996, he's always been a guy to universally collect. 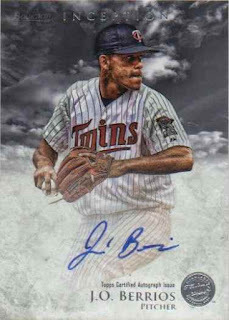 Whatever he's done has always captured my interest, though the luster had finally faded after he was suspended by Major League Baseball in 2014 - as is, he had a quiet and successful 'comeback' run in 2015, though it remains to be seen if he can sort of leave the game on his terms. 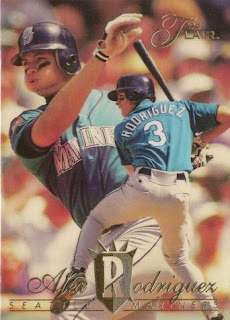 I probably paid $40 for this card and now it's worth about $5. 1989 Procards Keith Comstock #14 - I have to throw this 'fun card' into the mix. 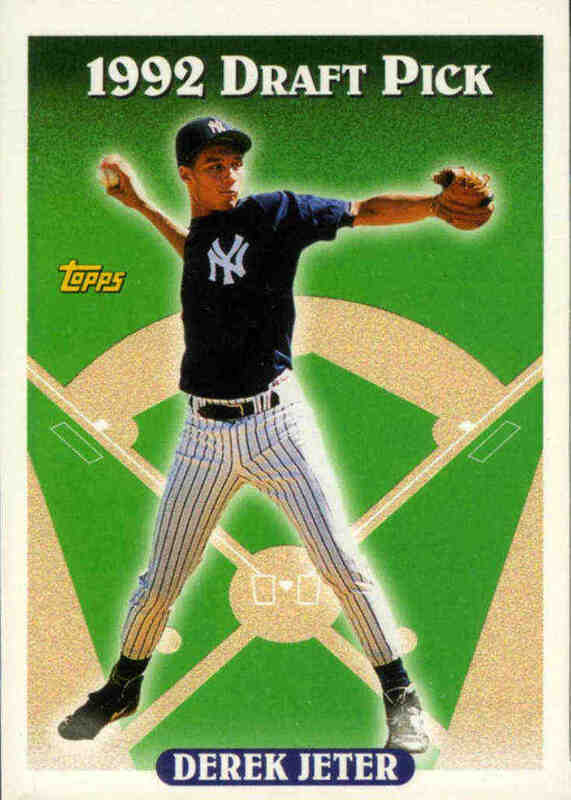 1993 Topps Derek Jeter #98 - he has always been a guy to universally collect and while I think this is a boring card from a boring set, it features a guy who put up some pretty good numbers, a 5-time World Series winner who always put on a good public face. 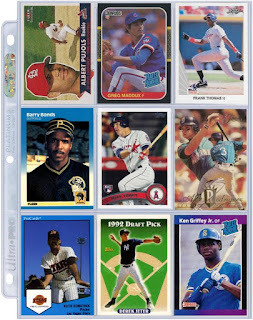 1989 Donruss Ken Griffey Jr.#33 - I was more or less just starting to collect 25 years ago when this card caught my attention in a loose stack at my cousin's house and I thought it was a big deal it was going for $8...during the same time, I think I bought a 1989 Donruss rack pack from a card shop and pulled another copy of the card.